Today Universal Orlando has updated the HalloweenHorrorNights.com website with the houses, shows, and scarezones that will be featured at this year’s event. From the looks of it we’ll have seven houses, six roaming scarezones, and two shows, which we’ll detail below. The full press release for this year’s event is available on Universal Orlando’s media website, or you can read about everything on the Halloween Horror Nights 22 website. Be sure to leave your thoughts about this year’s event in the comment section below, or on the ParkRumors forums! 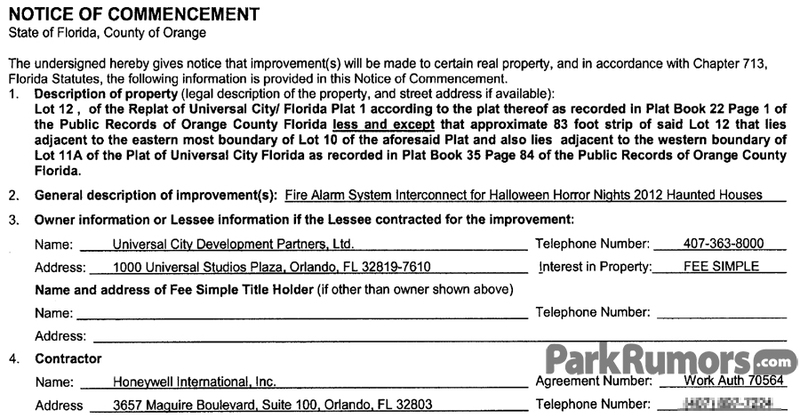 A new HHN permit was filed last week, finally filling the void left by the withdrawn permit for the BLDG44 house. 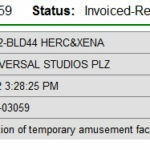 Ironically enough, however, for its first few days in the system, the permit still had its location (incorrectly) listed as “BLD44 HERC&XENA”. 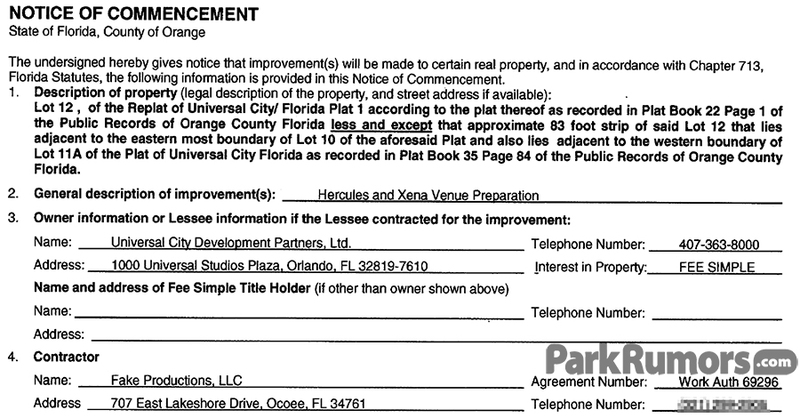 But now that the permit has started its review process, the location has been updated to B79, the parade building. 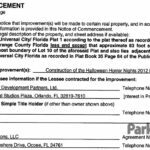 As the permit review process continues, we’ll hopefully find out a few scene names, much like we did with some of the previous permits. We’ll also hopefully find out if this is an entirely new house, or just the same house that was intended for BLD44 reconfigured to fit in the parade building. Legendary Shock Rocker Alice Cooper Evokes Maniacal Mayhem Inspired from his Landmark Concept Albums for This Year’s Eagerly-Anticipated Halloween Horror Nights experiences at Universal Orlando Resort and Universal Studios Hollywood. Event Marks Rock & Roll Hall of Fame Inductee’s First Haunted Attraction at Universal Orlando Resort and His Return to Universal Studios Hollywood in a New 3D Maze. ORLANDO, Fla., UNIVERSAL CITY, Ca. (July 24, 2012) — Multi-platinum recording artist Alice Cooper, a mastermind of the rock horror genre, will conjure up his peculiar vision of disturbing horror imagery in two new haunted attractions debuting this fall at Halloween Horror Nights at both Universal Orlando Resort and Universal Studios Hollywood. For the first time ever at Universal Orlando Resort’s award-winning event, Alice Cooper’s own version of a demented and dark subconscious will come to life in the haunted maze, “Alice Cooper – Welcome to My Nightmare.” Inspired by iconic elements from his first solo album, the attraction will put guests inside the haunted dreams of the album’s recurring character, “Steven,” as he endures the scream-inducing madness spawned from the mind of the legendary rocker. Making an encore performance at Universal Studios Hollywood’s acclaimed event, Alice Cooper’s new haunted attraction, “Alice Cooper Goes to Hell 3D,” will be inspired by the musician’s classic concept album centered on unending darkness, eternal torment and unimaginable horrors. The terrifying maze will beckon guests to experience hell’s interminable inferno as imagined through the eyes of hard rock visionary Alice Cooper. To experience this daunting new maze, guests will don 3D glasses for an optimum up close and personal three-dimensional encounter with Alice Cooper’s underworld. Rock & Roll Hall of Famer Alice Cooper pioneered the concept of the theatrical rock concert. His recording career spans six decades, includes more than two dozen albums, millions of record sales, countless world tours and appearances in scores of movies and videos, including “Nightmare on Elm Street: Freddy’s Dead,” Universal Pictures’ “Prince of Darkness” and a memorable appearance in the recent “Dark Shadows.” Last fall, Alice Cooper released his acclaimed “Welcome 2 My Nightmare,” his long-awaited sequel to his 1975 classic “Welcome to My Nightmare.” The album, which debuted onto the Billboard 200 at No.22, proves Alice Cooper’s continued relevance and popularity, cementing him as of one of music’s most influential artists of all time. For more information about Halloween Horror Nights at both Universal Orlando Resort and Universal Studios Hollywood, visit www.HalloweenHorrorNights.com. Watch Alice Cooper’s announcement video on Universal Orlando Resort’s YouTube Channel or on Universal Studios Hollywood’s YouTube Channel. 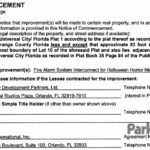 Universal Orlando Resort: There are many ways to enjoy your Orlando vacation, but there is only one place where vacation becomes adventure: Universal Orlando Resort. It is a unique destination featuring two theme parks, three magnificently themed on-site hotels and a nighttime entertainment complex. It’s the only Orlando destination where you are not just entertained – you become part of the most exhilarating entertainment ever created. You can soar above Hogwarts with Harry Potter, swing above the streets with Spider-Man, be transformed into a banana-loving minion in the hilarious and heartwarming Despicable Me Minion Mayhem ride and help Shrek save Princess Fiona in Shrek 4-D. Universal Orlando Resort is an NBCUniversal company. 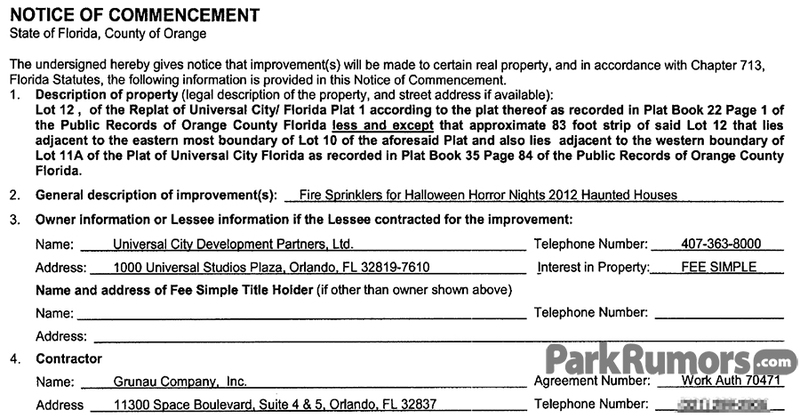 Now the event is down to only six haunted houses, the fewest its had since 2003. 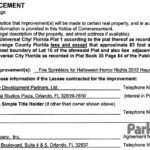 There have been numerous rumors and speculations about if/where the 7th house would be moved, ranging from the Parade Building (B79) to Sound Stage 23, and even Sound Stage 33, a venue never before used for a haunted house. We had expected to see a new permit filed for the 7th house along with the revisions, but the revisions were filed on June 22nd, and we’re yet to see any sign of a new permit, which makes us wonder if there won’t be a 7th house after all. More permit revisions still need to be submitted though, so there’s still the possibility of getting the 7th house back… but it’s almost July now, so they’re cutting it rather close. 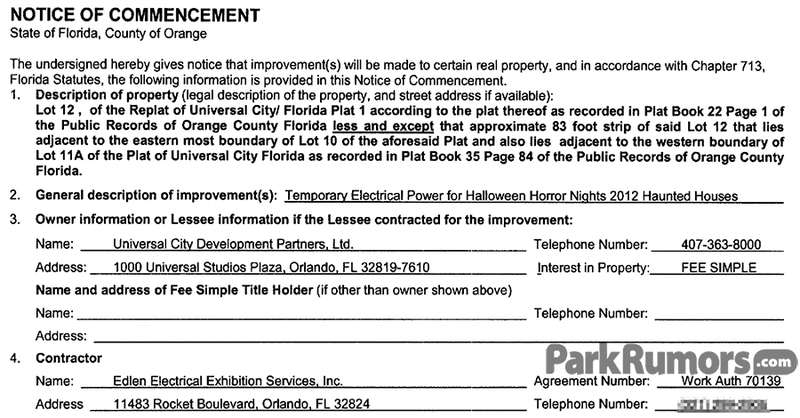 We’ll be sure to keep you updated as soon as any new HHN related permits are filed. 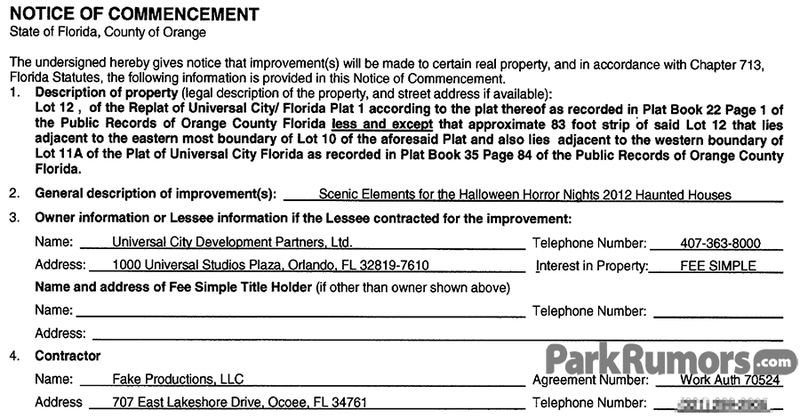 And finally, we leave you with one last question: Assuming we do get the 7th house back, do you think it’ll be the same house that was intended for Building 44, with scenes like “Creature Pit” and “Spike Room”, or do you think they designed an entirely different house to fit whichever new venue they decide to use? Let us know in the comments below, on our Forums, or our Facebook! 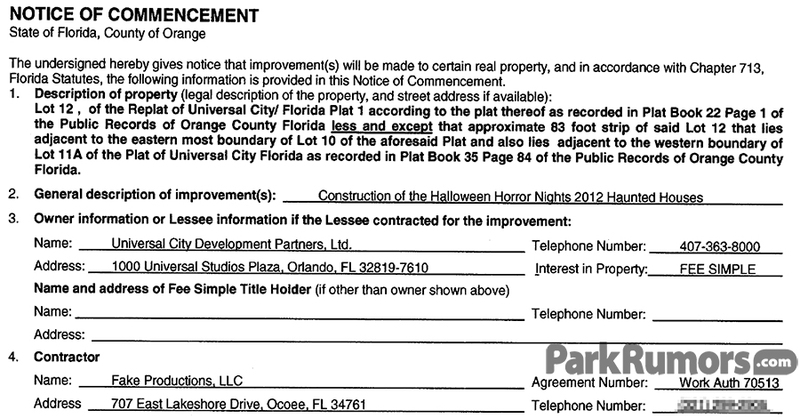 The permit review process has begun for the HHN 2012 house permits filed last week, and just like in previous years, it has given us our first clues of the themes of a couple of this year’s haunted houses, in the form of scene names. Please clarify dimensions for passage between rooms 4. Bat Belfry and room 5. Mirror Chamber. Considering that belfry is an old German term for bell tower, typically found on churches and castles, and often infested with bats, the house in SS20 A might be themed to either an old church or an old castle. Change in level on room 1. Hospital Hallway and room 4. Roof Top. Given that scene 1 of this haunted house is called “Hospital Hallway”, it’s likely that imagine the facade of this house will be a hospital of some sort. Then, we somehow manage to get to scene 4, “Roof Top”. Why we end up on the roof of this hospital is anyone’s guess. Perhaps we’re trying to escape? Or maybe something is chasing us? 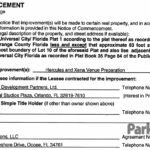 Turning space shall comply with Florida Accessibility Code for Building Construction. Ref. :Exiting from room 7. Creature Pit. Provide sprinkler coverage for “Spike room“. With only two generic scene names to go off of for this house, it’s pretty hard to take a guess at its theme, so we’ll leave this one open to speculation. 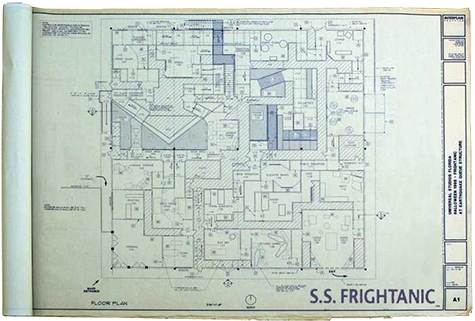 Provide sprinkler coverage for the “Vortex” room and the “Wrong side of the bed” room. With a room name like “Vortex” it’s almost a guarantee that this is where we’ll find the spinning tunnel this year. And the name “Wrong side of the bed” sounds kind of like a fun/wacky room, so perhaps the house in SS20 B is our ‘fun’/3d house this year? 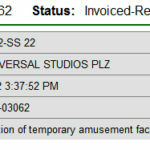 They typically don’t put these in the sound stages, so that would be an interesting departure from the norm. SS20 A – Old Church or Castle? 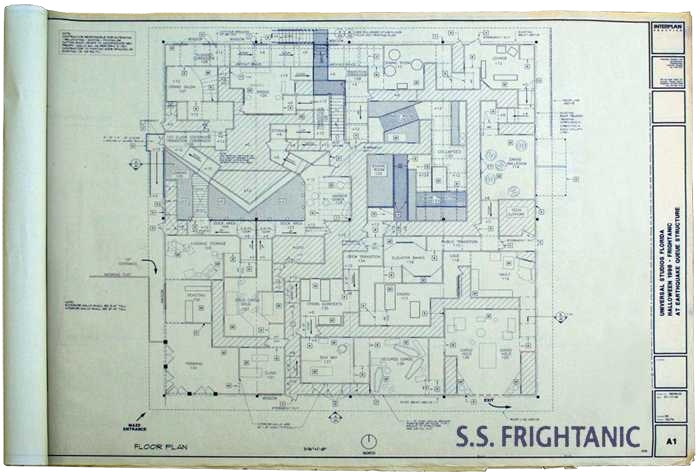 SS20 B – ‘Fun’/3d House? B67 Disaster Overflow – Hospital? 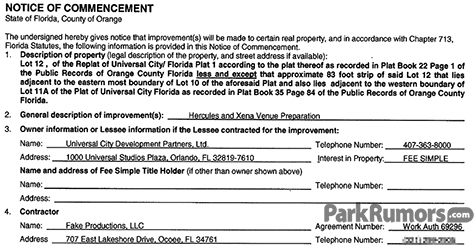 Be sure to leave your thoughts or speculation in the comment section below, or on the ParkRumors Forums! What’s interesting to note is that Universal has opted to use SS20 this year instead of the usual SS23. 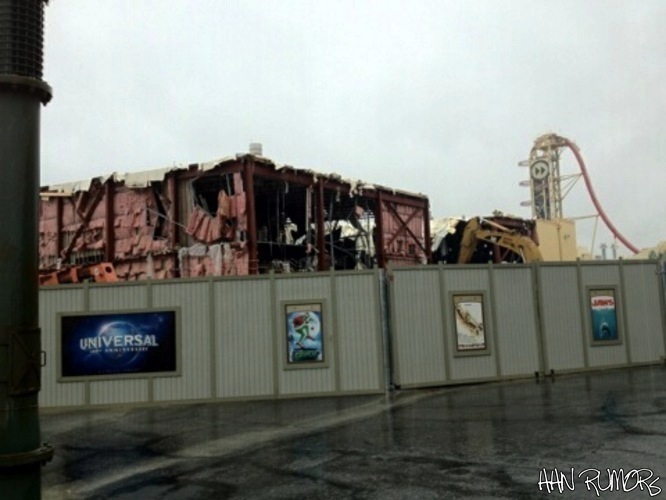 The last time we saw SS20 used was in 2008 when it housed Body Collectors and Interstellar Terror. SS23 was being used that summer for the production of “My Family’s Got GUTS!” so houses couldn’t be constructed during their normal June-September time frame, so SS20 was used to construct the houses and SS23 was used as queuing during the event. With the lack of an 8th house permit, it still remains to be seen if we will see an 8th (and potentially 9th) house in SS23, or if it’ll be used as queuing again. The only other possible location within USF for an 8th house would be the Parade Building (B79) which they have used every year since it was built in 2007. If the rumors of a two icon event prove to be true, this could be an excellent way to execute an icon house this year, with each icon having their own path. And just like in 1998, each path would be billed as a separate haunted house, bringing the house count up to 8. Of course, there’s also always the (unlikely) possibility that we’ll only have 7 houses this year, but we’ll worry about that if we don’t see an 8th permit go up within the next couple of days. 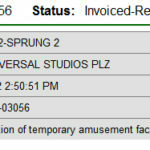 In the meantime, we’ve included the 7 HHN 2012 permits currently filed below. 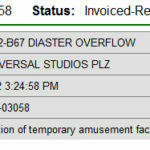 Be sure to leave any comments in the comment section below, or on the ParkRumors Forums.